Jesus is the Prince of Peace, and if He commanded His followers to love their enemies, turn the other cheek and not to live by the sword, then why do so many Christians today support wars, torture and nationalism? With an introduction by New Testament scholar Jon Zens, this book is a collection of articles and essays by author, blogger and teacher Keith Giles on the subject of Jesus and Non-Violence. Giles is also the founder of Pacifist Fight Club, a quarterly gathering of Christians in Orange County, California who meet to discuss issues surrounding Christian non-violence. This book explores typical arguments regarding the meaning of Jesus' statements against violence, as well as common objections related to the turning over of the tables of the money changers in the Temple, the command to "go and buy a sword", and various appeals to Old Testament scriptures where God leads the nation of Israel into battle. Whether you agree or disagree with the author on this controversial topic, you will be challenged and inspired to return again to the words of Jesus and to investigate your own heart and motives when it comes to obeying the radical call to love as Jesus loves. KEITH GILES CHRISTIAN ZIONISM: ISRAEL, PALESTINE, AND THE KINGDOM OF GOD. BRANDT RUSSO - "CAN YOUR GOSPEL TRANSFORM A TERRORIST?" 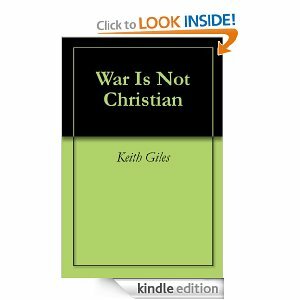 LISTEN: Part 2 of War is Not Christian with host Keith Giles.